The system logs contain simple logging and management information. You can choose to display specific log information, as well as exporting the log file to a chosen format. 1. Go to Reports > Logs > System. 2. Scroll down to the Settings panel. • Anti-malware engine — Displays information about the anti-malware engine. • Anti-Spam service — Log messages from the Anti-Spam system. Note that an Anti-Spam license is required to view this log data. For more information, contact your Smoothwall representative. • Authentication service — Log messages from the authentication system, including service status messages and user authentication audit trail. • Configuration migrations — Log messages when a system migration is performed. • DHCP server — Log messages from the DHCP server. Note that a Unified Threat Management serial is required to view this log data. For more information, contact your Smoothwall representative. • DNS proxy — Log messages from the DNS server. • DPI engine — Log messages from the Deep Packet Inspection (DPI) engine. Note that a DPI license is required to view this log data. For more information, contact your Smoothwall representative. • Datastore — Log messages about the Smoothwall log’s disk usage. • FTP proxy — Log messages about FTP traffic handled by the proxy. • Guardian blocklist — Log messages about requests made for websites on Guardian’s blocklist. • Guardian bypass — Log messages about requests made for websites that bypass Guardian’s web filter. • Guardian category — Log messages about requests made for websites in any Guardian category. Note that a Guardian license is required to view the above log data. For more information, contact your Smoothwall representative. • Heartbeat — Log messages from any configured heartbeat interfaces of failover systems. Note that a Unified Threat Management serial is required to view log data. For more information, contact your Smoothwall representative. • IM Proxy — Log messages from the Instant Messaging proxy service. • IPSec — Log messages from any configured IPSec tunnels. • Kernel — Log messages from the core Smoothwall operating system. • LCD panel — Logs any messages that have been displayed on the Smoothwall appliance’s LCD panel. Note that you must be using a Smoothwall appliance to view this log data. For more information, contact your Smoothwall representative. • L2TP — Log messages from configured L2TP connections. • L2TP PPP — Log messages from configured L2TP connections that use a PPPoE interface. • Message censor — Displays information from the message censor logs. • Monitor — Displays monitoring system information including service status and alert/report distribution audit trail. • NTP — Log messages from the network time system. • Network subsystem — Displays information from the internal network service. • PPP — Log messages from any configured PPPoE connection. • Reverse Proxy — Log messages from the Smoothwall’s reverse proxy service. • Routing service — Log messages from the routing service. • SIP service — Log messages from the SIP proxy service. • SMTP quarantine — Log messages from Anti-Spam’s SMTP quarantine. Note that a Anti-Spam license is required to view the above log data. For more information, contact your Smoothwall representative. • SNMP — Log messages from the SNMP service, if enabled. • SSH — Log messages from the SSH system. • SSL VPN — Log messages from any configured SSL VPN tunnels. • Safeguarding — Displays log messages from the Safeguarding instant alerts service. • Service messages — Displays log messages from other services not mentioned in this list. • System — Simple system log messages, including startup, shutdown, reboot and service status messages. • SystemD — Log messages from the system super server. • UPS — Log messages from the UPS system, including service status messages. • Update transcript — Displays historical information about all installed releases and updates. • Web filter — Log messages from Guardian. Note that a Guardian license is required to view this log data. For more information, contact your Smoothwall representative. • Web proxy — Log messages from the web proxy service. 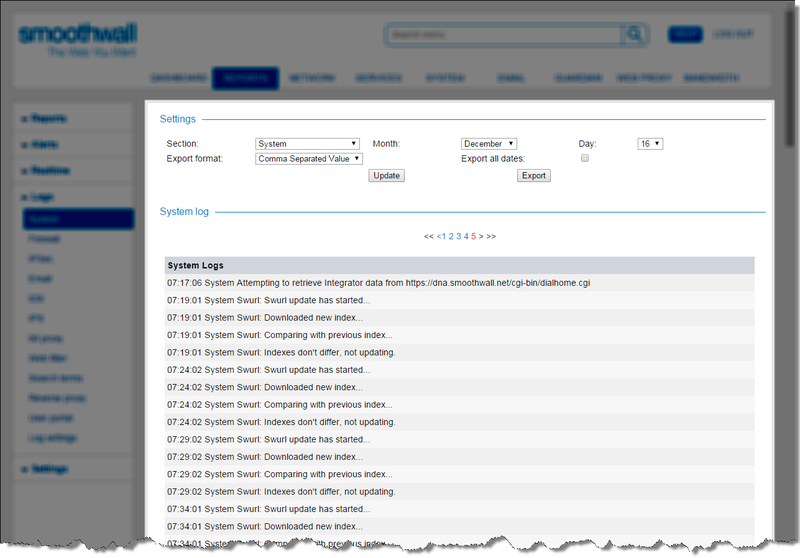 You can also choose to export system logs to a chosen format. • Section — From the drop-down list, choose the log messages to export. For a detailed description of each section, see Viewing System Logs.